"Since the latest round of tariffs are being phased in—not rising to 25 percent until 2019—you have some time to adjust your budget, and your holiday shopping won’t get hit by the highest rates." The trade war is officially escalating. On top of the tariffs placed on billions of dollars worth of imports from China earlier this year, President Donald Trump has added a 10-percent tax on another $200 billion worth of Chinese products, in effect as of September 24, and is planning to raise the tax to 25 percent on January 1, 2019. Some of the goods on the hit list: luggage, seafood, fruit, furniture, baseball gloves, network routers, industrial machinery parts…clearly, a wide range of stuff. That means this issue stands to affect pretty much all of us, making shopping more expensive this season. 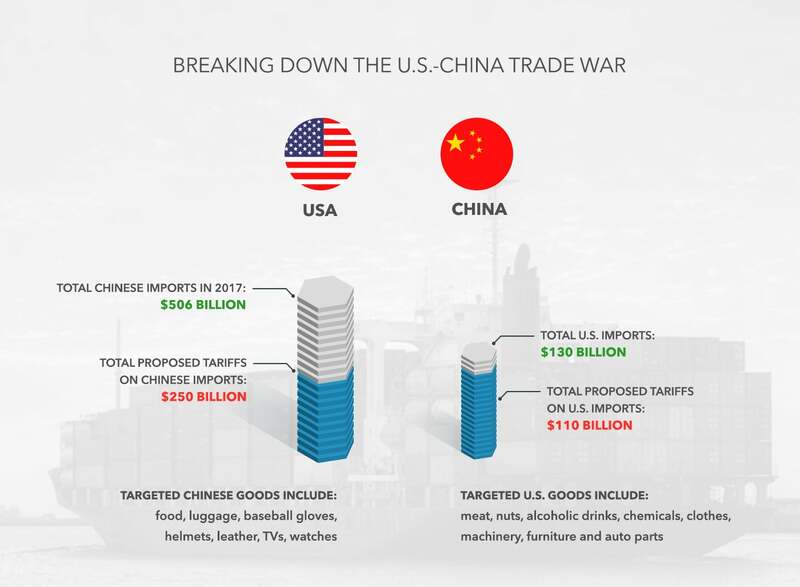 China has already retaliated with tariffs of 5 to 15 percent on $60 billion of U.S. goods from chemicals to clothes and auto parts, and pulled out of scheduled trade talks, escalating tensions even more. Back up. What’s a tariff again? It’s a special tax on specific imported goods and services, making them cost more. Yep. In fact, tariffs have been used by the U.S. (and many other countries) throughout history to control the amount of imported goods and services coming into the country—often to protect U.S. industries from foreign competition—and to punish other countries that have crossed us. Trump says he is using tariffs to punish China and other countries for treating the U.S. unfairly in terms of trade. He expects that by raising these taxes on imports, American consumers will be discouraged from buying them and instead look for less costly domestic alternatives, which would effectively lower revenues for the exporting countries and help boost sales of U.S.-made goods. TBD. Dozens of domestic farmers, ranchers and U.S. companies have complained that the retaliatory tariffs imposed on U.S. goods have hurt them. (The Trump administration has said it plans to give U.S. farmers and ranchers hurt by the trade war $12 billion in relief to mitigate the impact of tariffs on their exports.) Companies like Harley-Davidson, General Motors and General Electric and several others, have seen profits hit by tariffs, too. On the other hand, U.S. steel companies have seen demand, and profits, rise from Trump’s 25-percent steel tariffs on imports. History shows that trade wars aren’t typically so simple, though, and can carry big risks. The last time we were in a similar situation was 2002, when President George W. Bush imposed tariffs in an effort to lift the U.S. steel industry, raising rates from up to 1 percent to between 8 percent and 30 percent. The results? Disaster. As for a worst-case scenario? The biggest trade war in history kicked off in 1930 with the signing of the Smoot-Hawley Tariff, which levied taxes averaging more than 45 percent on nearly 900 items imported from many other nations. It led to retaliatory measures by at least two-dozen other countries and was blamed for worsening the effects of the Great Depression—and even for contributing to the rise of political extremism that helped leaders like Adolf Hitler gain power. Of course, the world is a different place now than it was in 1930 and even 2002. Still, economists and trade experts agree that the current policies could be dangerous for America. For one thing, the global economy is more interdependent these days, making an “America First” approach challenging. What does this all mean for me? Higher costs on products across the board. (Walmart and Target have both warned the latest tariffs could lead to increased prices for customers.) On the bright side, since the latest round of tariffs are being phased in—not rising to 25 percent until 2019—you have some time to adjust your budget, and your holiday shopping won’t get hit by the highest rates. Plus, about 300 products have been removed from the original tariff list released in early July, including smart watches, Bluetooth devices, bicycle helmets, high chairs and car seats. But if Trump makes good on threats of tariffs on an additional $267 billion worth of Chinese imports—which would effectively cover nearly all the products China sells to the U.S.—other Apple products, including the iPhone, may still get pricier. In fact, one way China may retaliate (it’s running out of tariff options, given that it imports far less from the U.S. than it exports here) is by making it harder for U.S. companies in China, such as Apple, to do business there. So the trade war poses a double threat against Apple and its customers. Unfortunately, those multinationals are also not giving Trump what he wants at this point. Only 6 percent of the members of the American Chamber of Commerce in China say that they’d consider moving their operations back to U.S. soil due to the current trade dispute. Meanwhile, American businesses and consumers are left to cope with the higher costs. The Bull Market Just Turned 10. What’s Next?